As you may have noticed there is a lot of memory associated with a lot of food that I love eat and cook. I love sharing, so here is another one for you all! Every time I make or eat this dip it takes me back to the first time I was introduced to it as well as the first time The Sous Chef was introduced to it. In the early eighties I was in elementary school and a kid who was used to the free life in Italy but lived where whatever happened at home remained at home. So if there were parties, gatherings, and alcohol was served, the information was not to be shared with anyone out of fear that the news would get passed on the the Komiteh, ya know the ones that made sure that no one had a good time and obeyed the rules of the clergy. One day my father and his girlfriend at the time we putting together a pool party. I was only there during the set up time. As they were putting the food items out I got to taste this new dip which I had never had before. It was white and looked like yogurt but it had a strong smell to it. I was told that you ate it by dipping a potato chip in it. So I complied. There was something so delicious about the combination of flavors. I loved how the delicate flavor of the firm yogurt with a touch of shallots came together with the saltiness of the potato chips. My life has never been the same after thats day. In some funny way, today this dip is one of my favorite comfort foods. I just love, love, LOVE it! The world can come crashing down, but all will be well as long as I get to curl up on the couch with my mast-o-musir and chips. The first time The Sous Chef tried this dip he would have licked the inside of the container it came in if he could, that’s how much he liked it! So here is the story: for our first monthversary, yes you read it right, month-versary, I know it is a bit cheesy, but bear with me, I took the Sous Chef on a beach picnic. I packed a nice spread of Iranian food, amongst which was a store bought container of mast-o-musir. It was a love affair from the very first taste, I tell ya.! Next thing I know, the ambitious man that he is, he started making his own masto-o-musir. Nowadays, the store bought kind is not good enough for him! He literally will eat spoon fulls of mast-o-musir! The picnic was a success and as time went by I sure realized that whomever said that “the way to a man’s heart is through his stomach” was not smoking crack! It is true, I am sure The Sous Chef can attest to that! Back to business here! Enough about the stories, let’s move on to this very difficult and complicated recipe, NOT! It is actually a very simple recipe and it only takes a few minutes to prepare, BUT it is best to let it rest a few hours in order for the flavors to blend in. One more thing before we start. I would like to point out that there are a couple of options as far as the shallots go. Some people like to use dried shallots others like to use fresh shallots. We always make our Mast-o-musir with fresh shallots. We love eating this dip with either pita chips or regular potato chips. You can also serve it with bread, if you wish. I had a couple of shallots and for this recipe I picked the one of the left. Fine dice the shallot. Beware, your eyes and nose are going to be affected during this process. I love shallots, but I hate the fact that they make me cry every time I chop them! Anyway, sometimes shallots can be bitter. Some people let them soak in water for a few hours to release the bitterness. We don’t but the important thing is to not go overboard with shallots, if you have too much, it is going to completely overpower the whole dip. Unless you are like The Sous Chef who likes to eat his shallots with yogurt!!!!! Place the lebni and shallots in a bowl. Mix them thoroughly. Cover and place in the fridge for a few hours. 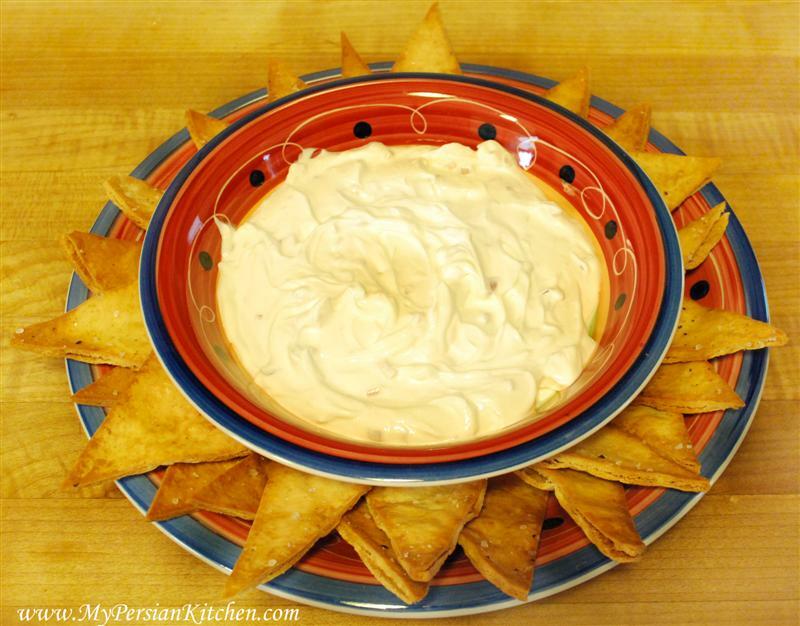 Serve with regular potato chips or pita chips. Looks wonderful. How I LOVE lebni. Me too! Lebni is just simply awesome! Does the shallot give it the “garlicy” tast? I always assumed that mast-o-musir had garlic! Wow. This is quite an education. BTW, my Mom is here from Iran for 10 days and making me Persian Food! I’m in heaven over here. I think we’ll run to the store and get some shallots…. I don’t know if I would say garlicy. Shallots are from the onion family, but they taste sweeter and a bit more delicate. I love using shallots when making red wine reduction sauces or even a vinaigrette. Wikipedia says Lebnis is strained yogurt. I make yogurt at home with full-fat milk and strain it in a cheesecloth because I like the Greek-yogurt like texture. Would that be the same? This recipe sounds really yummy!!! ap269, Lebni is very thick yogurt. I would definitely say that it has the same consistency as Greek yogurt, which I love as well, especially with some honey! The shallot Iranians use in mast-o-mooseer is not exactly the same as the common shallot one sees in the West. It is a special kind known by the botanical name “Allium hirtifolium Boiss”, and is commonly called “Persian shallot”. hello, and what a delicious blog since you say persian shallot is different, and not the same as the one commonly known in the west, would you recommend making this dip simply substituting the western shallot for the persian for those who have no access to the persian shallot, or, is there another addition you could recommend so that the final result might come closer to the original? thank you! I’m making this for the first time – for the Oscar party I’m hosting – in honor of “Argo”. I saw other recipes have 2 cups lebni or yogurt to 1 shallot while yours has 1 cup. Should I choose a smaller shallot if using 1 cup?